If you're like me, you have the hardest time keeping up with your Instagram posts and GoPro edits while on the mountain. Your fingers are always getting cold when you take off your gloves to select the best photo filter, and there's never enough time on the lift to think of a really inspirational, yet witty caption. And by the time you get off the mountain, upload and edit your latest POV footy for the 16 subscribers (including mom) on your YouTube channel, the edit already feels old hat. The demand for new, fresh, viral contact is higher than ever and we've got to find a way to give the people what they want. Thankfully, help is near. Early last week, a new campaign launched on Kickstarter for a new helmet so jam-packed with wearable technology you'll be the envy of every A.I. robot since Haley Joel Osment. Your Instagram likes and follows will skyrocket with every radio wave that pulses through your skull. Despite being made from single-impact foam, meaning if you crash once, the helmet's toast, the new Forcite Alpine has a built in 4K action camera, helmet-to-helmet communication system, advanced sensors to track your lines, and audio to bump beats and call grandma. But wait, there's more! It all comes with the ability to post your adrenaline filled action shots on social media INSTANTLY. As in, IMMEDIATELY. As in, while you shred, your crazy robot helmet is posting your best footy to the interwebs so you can concentrate more on being radical than lifting your poor, cold fingers. The Forecite, slated to be on sale by January, will only run you $800—a small price to pay for social media stardom. The ultra-high definition camera system and image stabilization makes every one of your runs look pro. No other skills needed! Your Forcite Alpine allows you to track speed, altitude, distance, airtime, and number of runs. When you are back at the bar, don’t just talk about how creepy rad you are—prove it! Thanks to innovative new software, your helmet can instantly cut the footage and send a film reel of your most adrenaline packed moments for you to relive on your smartphone. It’s the perfect helmet for skiers who can’t remember anything that happened that day. 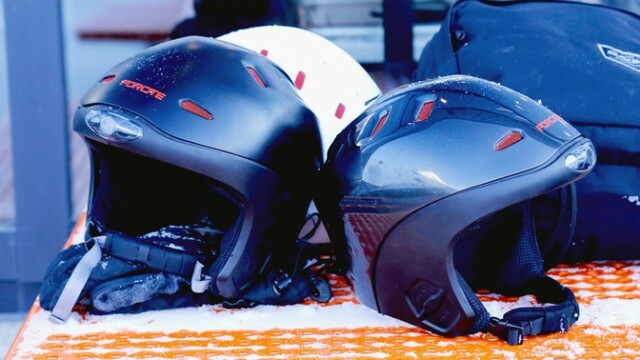 And as part of the campaign's "Never Carve Alone" movement, with your Forcite Alpine you can set up helmet-to-helmet communication groups of up to three people, with connectivity up to 200 meters. No need to call or text (as that would likely interrupt your 'Gram game). Never get lost, never have a moment to yourself, and more important, never lose a chance to brag. No more escaping to the mountains and feeling disconnected from the world (ew! ); now complete strangers will know where you are and what you're doing every time you drop in. Bluetooth capability is built right into your brain helmet too, should you need to make a call, perhaps to reschedule your deep tissue massage, or listen to your favorite Train album on shuffle. If you're not yet convinced this is the gadget to blow your cash wad on this season, this should push you over the edge. The Forcite Alpine comes with 400 lumen trail lights designed to make sure you are able to, and I quote, "find your way back to the car."